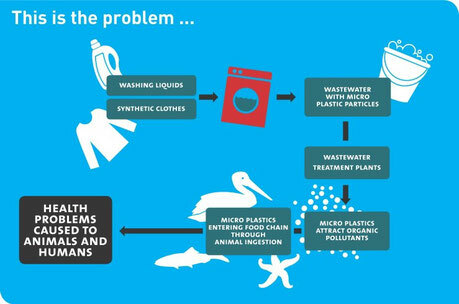 Did you know you are contributing to marine pollution by washing your clothes? Every year, Europeans do around 36 billion loads of washing and most of them contain synthetic clothes, releasing millions of non-degradable fibres into the waste water. Most of these fibres slip undetected through water treatment plants and out to the sea. Who are the major culprits? Acrylic, nylon and polyester. Eventually, fish mistake these fibres for plankton when they end up in the oceans and seas. Around 65% of the shrimp in the North Sea contain synthetic fibres. And, guess what? We are at the top of the food chain, so they end up in our plates. Fill up your washing machine to the max: washing a full load results in less friction between the clothes and, therefore, less fibres are released. Use washing liquid (not fabric softener!) instead of powder: the ‘scrub’ function of the grains of the powder result in loosening the fibres of clothes more than with liquid. Wash at a low temperature: when clothes are washed at a high temperature some fabrics are damaged, leading to the release of fibres. Avoid long washings: long periods of washing cause more friction between fabrics, which supposes more tearing of the fibres. Dry spin clothes at low revs: higher revolutions increase the friction between the clothes, resulting in higher chances of fibres loosening. Avoid buying synthetic clothes and look for wool, cotton, linen, silk, cashmere or other natural fabrics. if you need a new machine get the ones with a special filter! !